The retired army officer, one of the many SLPP presidential aspirants aggrieved at the tribalistic and unpatriotic manner the party decided to choose its presidential candidate for the November elections, granted COCORIOKO an exclusive interview before he boarded his plane at the Boston International Airport for Freetown where, along with other former SLPP Presidential aspirants Mr . Usman Wusu Boie Kamara and Madam Khadi Johnson-Cole, he will be officially joining the ruling APC in a major political event that will rock the city on Saturday. Asked by this newspaper to explain for the benefit of the public why he really decided to quit the SLPP, Major Koroma took a deep breath and explained. He said that since 1961 when Sierra Leone became independent and Sir Milton Margai governed the country as Prime Minister, he used the SLPP, his party to preach national unity and he brought Sierra Leoneans under one banner with the motto, unity , freedom and justice. He was against tribalism, corruption and injustice. He preached non-violence until he died in 1964 and his brother, Sir Albert Margai, took over. He said that was the SLPP he grew up to know but he regretted that the SLPP has changed dramatically over the decades to a tribalistic , violent and unjust political party. Major Koroma confessed that he was actually against President Koromaand was determined to contest against him but he explained that when he and the Head of State met , President Koroma told him : “Look here, Major Koroma. Go to your home in Kailahun District and see all the developments I have done there. If you are not impressed, do not bother to come back and meet me. ” Major Koroma, who had lived in the U.S for long , said he went to Kailahun and, lo and behold, what he saw there was so remarkable and impressive that he quickly returned to Freetown and told the President: “Pa, you done woke O nar me district . Tenki, tenki.” ( “Mr. President, you have done a great job in my home district ” ). The one-time American army officer said that the infrastructural developments President Koroma has carried to Kailahun are pivotal to national development. Major Koroma told COCORIOKO that the people of Kailahun are very hardworking and they engage in massive agricultural projects but since time immemorial, they had been unfortunate to have the worst road network in the country and as such had serious problems to move their produce to the headquarter town . “Since God created the planet, Kailahun did not have paved roads”, he emphasized but triumphantly told this newspaper that today the road network is first class . The Pendembu-Segwema Road has been made and all the once dangerous bridges had been reconstructed .”The bridges are like America’s . I have all the pictures “, he stated jubilantly. He said that everybody is praising the President in Kailahun. Even the oldest mosque there has been reconstructed by President Koroma , he explained. Major Koroma confessed that Sierra Leone would have been the best country in Africa if all the other heads of state we have had since Independence had worked the same manner as President Koroma. And he said that if after the President’s terms, other leaders come and do the same thing, Sierra Leone will be a great nation indeed. Another achievement the Major singled out was the new salary of teachers. He said that they get paid over Le. 800,000 which was better, compared to the past. “If you have somebody like this, why would you not want to work with him ? “, he asked. The retired U.S. Army Major said he did not know President Koroma untilhe called him and asked him to join him during the last UN General Assembly where the President was singled out among the 53 African heads of state to share the high table with U.S. President Barak OBama and the UN Secretary General, Ban Ki-Moon. He was highly impressed with the recognition given to the President. He marvelled at the recognition President Koroma has brought for the country and disclosed that even in the field of UN Peacekeeping, Sierra Leone is now highly respected and our soldiers in Somalia just captured a town. COCORIOKO : After Saturday, what next ? The army major said that then starts the big work to get Kenema and Kailahun for the APC. He declared that Kailahun had fallen to President Koroma. He predicted that President Koroma will have 55% of the votes there. It is Kenema where a lot of work has to be done, he said. He promised to help to mobilize the youths for the APC. Already, there are 150 teachers in Kenema waiting for him to declare for the APC themselves. COCORIOKO asked him what message he had for the SLPP. In response, Major Koroma said that he had gone on the SLBC and vehemently supported the President. 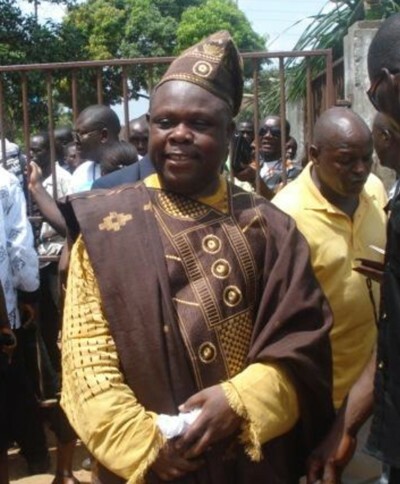 He advised the SLPP to see the truth. Mr.Koroma stated that flagbearer after flagbearer had said the same things about the SLPP. They should see the truth, he stressed. Major Koroma , in conclusion, said that because he is a development-oriented Head of State, anybody who goes against President Koroma will fall. Armed robbery and youth protest in East End : Why try to give them a political twist ? Journalist Khadeeja Savage: Gone with the dream that never was!